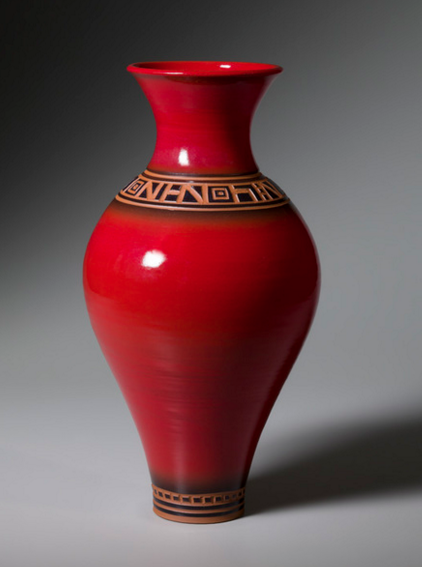 I have been com­mit­ted to clay ever since first touch­ing it in a high school Art class over 35 years ago. While I have learned many things from many dif­fer­ent peo­ple over the years, I am pri­mar­i­ly self-taught. 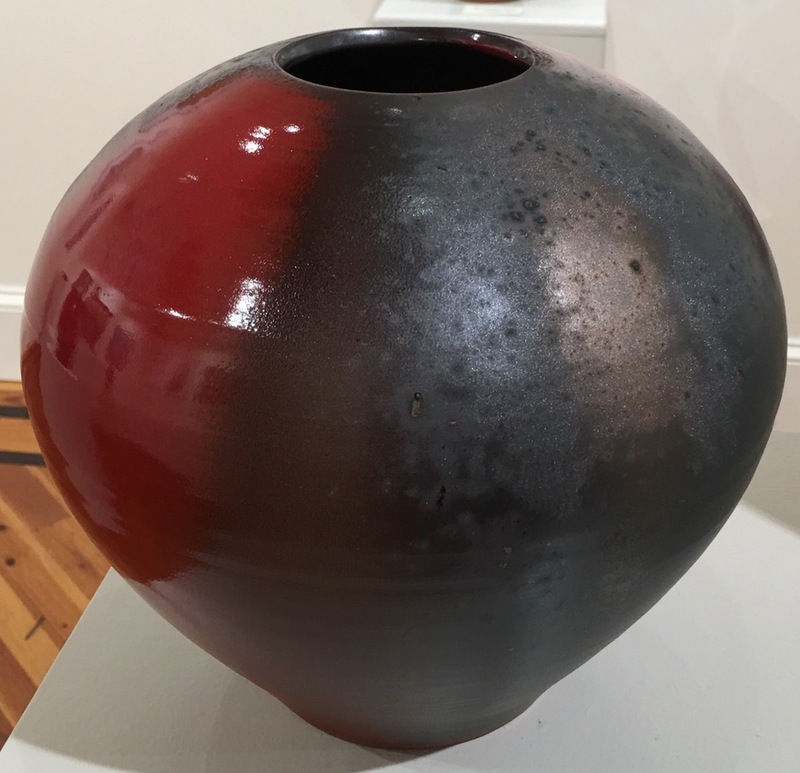 I have been a stu­dio pot­ter pro­duc­ing func­tion­al Ter­ra Cot­ta in north­ern Orange Coun­ty since 1982 and began work­ing from my home/studio in the woods near Cald­well NC in 1988. 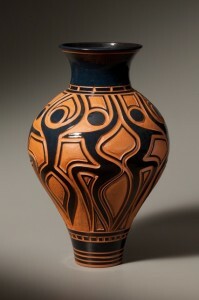 All of my pots are made from red clay on a potter’s wheel. 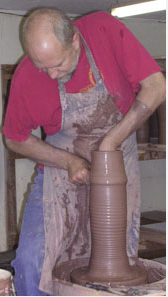 Some are “coil and throw”, a tech­nique where a coil of clay is joined to the lip of a form on the wheel and thrown to an addi­tion­al height. Very large pieces can be con­struct­ed by using sev­er­al coils in this man­ner. When the clay has become “leather-hard”, or stiff­ened up enough to han­dle, the dec­o­ra­tive glaze work is accom­plished by spray­ing one or more glazes onto the pots . I some­times add addi­tion­al col­ors by brush­ing or spray­ing pig­ments over the glaze. 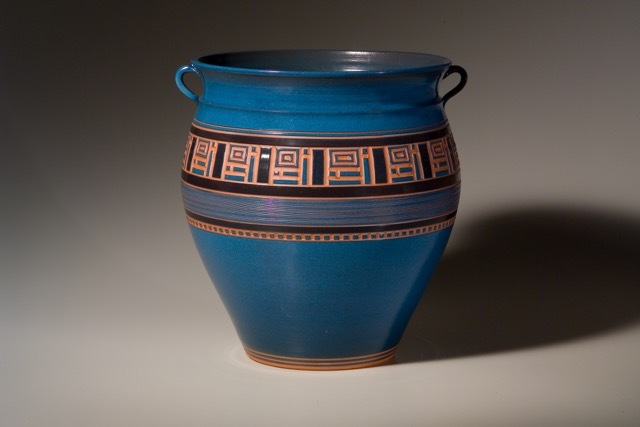 I then carve through the glaze into the still damp clay to achieve the var­i­ous pat­terns you see on my pots. 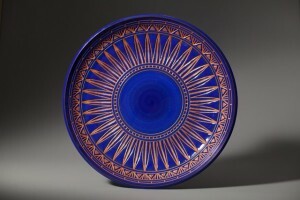 When the pots are com­plete­ly dry they go into the kiln and are fired to 2125 degrees fahren­heit. 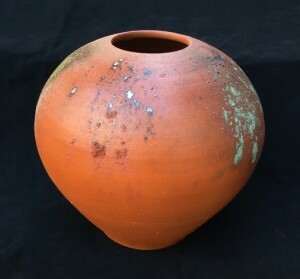 The Potter’s Wheel seems to me very much like a musi­cal instru­ment in that prac­tice and dai­ly use is nec­es­sary to become tru­ely pro­fi­cient. My Pots are the songs that result. Shape is the melody, pat­tern the lyric. Their rythym comes from the con­tin­u­ous flow of work. Some are songs I have played for many years that peo­ple still love and want, and so I con­tin­ue to make them, with great joy in the vari­a­tions. Vari­a­tions that ulti­mate­ly lead to new pat­terns which dic­tate changes in the shapes, bring­ing it back once again to the clay spin­ning on the wheel and a new cycle begin­ning. VIEW SLIDESHOW: Click on any thumb­nail below. To ENLARGE: click diag­o­nal arrows. Click them again to return to slides.